John Strouse, one of the Travel and Hotel Management professors at UNOH, is looking outside of his classroom walls to get hands-on experience for his students. Over Summer Quarter, he led one of his classes to the Hollywood Casino in Toledo. Students had the opportunity to hear the PR Director and Director of Enforcement of the Ohio Casino Control Commission speak. The students learned about different laws, policies, and procedures the four Ohio Hollywood Casinos have to follow. Volunteered at the West Ohio Food Bank in Lima, observing Food Service and Community Service. There was guided tour and then sorting and re-boxing Campbell Products to be sent to food pantries, as well as assembling volunteer bags. The class also listened to a few guest speakers from AAA Auto Club Travel Agency, Northwest Travel, Lima CVB, West Ohio Food Bank, Fairfield Hotel Financials, and UNOH Career and Alumni Departments. “The opportunity to do field trips and hear guest speakers brings the concepts and learning not only to life, but in some cases gives them some hands-on experience to understand which field of Travel and Hospitality they may want to focus their career aspirations on.” states Strouse. Each year the students are afforded an annual experience trip where the students plan the itinerary from top to bottom. Destinations have ranged from cruises to out-of-state adventures. During the trip, students observe guest relations, hospitality marketing, and means of travel logistics, event management, and lodging operations at the location where they are staying. 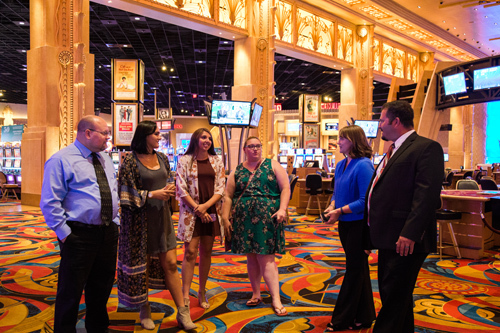 The Travel and Hotel Management program is becoming more and more popular among students because of the vase amount of opportunities you get to experience and the many different directions your career can take you after graduation. For more information about the Travel and Hotel Management program, visit: http://www.unoh.edu/academics/college-of-occupational-professions/travel-hospitality.html or contact UNOH Admissions Office at (419) 998-3120.